Researchers working on the edge of a coal mine in India have unearthed fossils dating back 54.5 million years that provide crucial evidence about the origins of the horse. 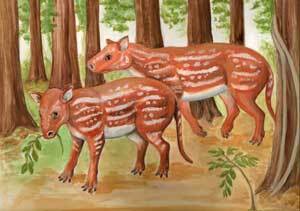 The fossils suggest an ancestor of horses and rhinos originated on the Asian subcontinent while it was still an island. Working at the edge of a coal mine in India, a team of researchers from Maryland’s Johns Hopkins University and their international colleagues have filled a major gap in science’s understanding of the evolution of a group of animals that includes horses and rhinos. That group likely originated on the isolated subcontinent when it was still headed swiftly for collision with Asia, the researchers reported this week in the online journal, Nature Communications. Modern horses, rhinos and tapirs belong to a biological group, or order, called Perissodactyla. Also known as “odd-toed ungulates”, animals in the order have, as their name implies, an uneven number of toes on their hind feet and a distinctive digestive system. Though paleontologists had found remains of Perissodactyla from as far back as the beginnings of the Eocene epoch, about 56 million years ago, their earlier evolution remained a mystery, says Ken Rose, a professor of functional anatomy and evolution at the Johns Hopkins University School of Medicine. Rose and his research team have for years been excavating mammal fossils in the Bighorn Basin of Wyoming, but in 2001 he and Indian colleagues began exploring Eocene sediments in Western India because it had been proposed that perissodactyls and some other mammal groups might have originated there. In an open-pit coal mine northeast of Mumbai, they uncovered a rich vein of ancient bones. Rose says he and his collaborators had obtained funding from the National Geographic Society to send a research team to the mine site at Gujarat in the far Western part of India for two weeks at a time once every year or two over the last decade. The mine yielded what Rose says is a treasure trove of teeth and bones for the researchers to comb through back in their home laboratories. Of these, more than 200 fossils turned out to belong to an animal dubbed Cambaytherium thewissi, about which little had been known. The researchers dated the fossils to about 54.5 million years old, making them slightly younger than the oldest known Perissodactyla remains, but Rose says it provides a window into what a common ancestor of all Perissodactyla would have looked like. “Many of Cambaytherium’s features, like the teeth, the number of sacral vertebrae, and the bones of the hands and feet, are intermediate between Perissodactyla and more primitive animals,” Rose says. Cambaytherium and other finds from the Gujarat coal mine also provide tantalizing clues about India’s separation from Madagascar, lonely migration, and eventual collision with the continent of Asia as the Earth’s plates shifted, Rose says. In 1990, two researchers, David Krause and Mary Maas, of Stony Brook University, New York, published a paper suggesting that several groups of mammals that appeared at the beginning of the Eocene, including primates and odd- and even-toed ungulates, might have evolved in India while it was isolated. “Around Cambaytherium’s time, we think India was an island, but it also had primates and a rodent similar to those living in Europe at the time,” he says. Rose said his team was fortunate to have discovered the site and that the mining company allowed the researchers to work there, although he added: “It was frustrating to know that countless fossils were being chewed up by heavy mining equipment”. When coal extraction was finished, the miners covered the site, he says. His team has now found other mines in the area to continue digging. Other authors on the study were Luke Holbrook, of Rowan University; Rajendra Rana, of Garhwal University; Kishor Kumar, of the Wadia Institute of Himalayan Geology; Katrina Jones and Heather Ahrens, of Johns Hopkins University; Pieter Missiaen, of Ghent University; Ashok Sahni, of Panjab University; and Thierry Smith, of the Royal Belgian Institute of Natural Sciences. This study was funded by the National Geographic Society, the Belgian Science Policy Office, the National Science Foundation, and the Wadia Institute of Himalayan Geology.